Poll: What’s Your Take on the Final Play in the Buccaneers-Giants Game Sunday? The talk of the NFL today is the final play of the exciting week two game between the Bucs and Giants. If you didn’t see it, Giants QB Eli Manning was knocked down in the final-play kneel-down by the Bucs defense. On the play the Bucs’ defense dove at the middle of the Giants’ offensive line, sending right guard Chris Snee back into a startled Eli Manning, who fell over on the play. 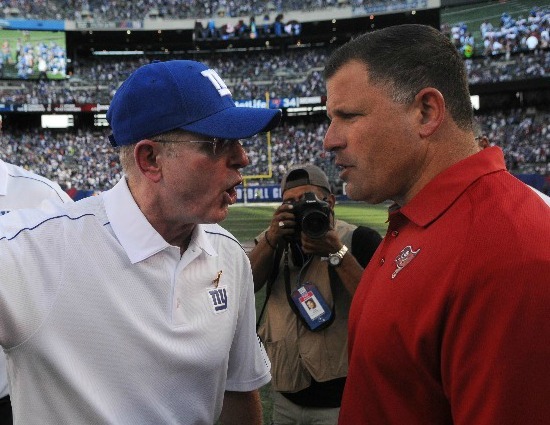 Giants head coach Tom Coughlin made it known after the game that he didn’t take too kindly to the gesture, and let Bucs rookie head coach Greg Schiano know about it. So today the big question – was the gesture cheap? Or was it just good, hard play it to the end, as Schiano put it? Was the Bucs Pushing at the Final Play Kneel Down Sunday Cheap?